I never quite know how to show a scarf in progress on my blog. For the most part, they’re long and unwieldy, and since I do most of my photos indoors at night, it’s not like I can take them out and hang them from the fence post to shoot them outdoors. So today, I’m enlisting my pal Hedda, my trusty hat model, so you can see the pattern in my scarf. Problem is, doing it this way doesn’t really show how LONG the scarf is, which is of what I am most pleased at the moment. It’s about 4 feet long at this point, which means, dear people, that I am nearly DONE, or at least about four-fifths done, and yes, I’m thinking of other knitterly things. At least one person has asked me if this scarf is of my own design. Well, yes, and… no. 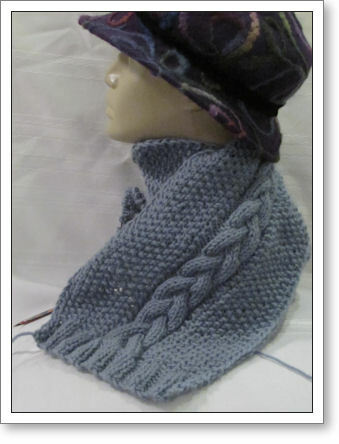 It’s a simple thing, really, in a basic seed stitch with a plaited cable in the center. So, nothing earth-shatteringly new there. But, someday soon I will write it all down for the curious and post in these pages. Perhaps when the thing is finished. I’ve been away from the blog for a long while. No good reason, really… but I will say that this summer I have been in a kind of a slump. It was just the scarf and me, all summer long, day in and day out… and I thought certainly it would be too boring to hear of this same project over and over, so, instead I’ve been quiet. While knitting this scarf I have been pondering my next one, which is a commitment I’ve made to do a Special Olympics scarf. In the meantime I’ve developed a strong love-hate relationship with knitting scarves at all, so I’m starting to lose hope a bit that the next project will ever get off the ground. What is it with scarves, anyway, and why does something that seems so simple take forever to do? 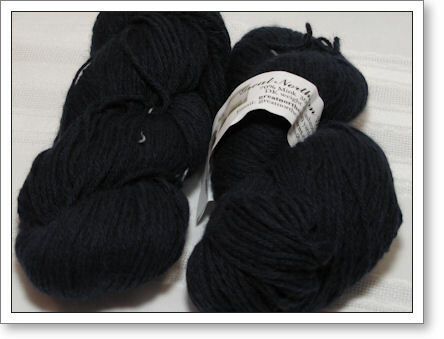 This is the Mink and Cashmere Yarn from the Great Northern Yarns company. The fiber content is 70% mink (sheared) and 30% cashmere. It sounded on the surface, like it should feel like the most amazingly luxurious yarn ever made. Well, let’s say that I was somewhat under-impressed for what I was thinking it should feel like. Don’t get me wrong, it’s certainly soft, but I’ve had my hands on a mink coat or two in my lifetime and well? I guess I was expecting it to feel like that. And it doesn’t. Not really… but it did sort of remind me of this silk that I have, at least in the feel of it. I haven’t knit with it yet so I don’t know what it’s like to knit with. But I’m thinking maybe someday DH will get a scarf out of this to go with his dress coat. He can’t stand the feel of wool (“itchy”) so I think this will fill the bill for him, someday. This is my friend Jackie, from knit group. 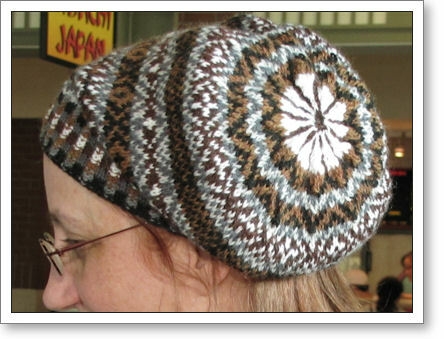 She is a relatively new knitter, and she made THAT hat, from the book, Colorwork Creations: 30+ Patterns to Knit Gorgeous Hats, Mittens and Gloves . I’m very proud of Jackie. She came to us I think less than a year ago, learning to knit her first scarf, and now, she is fearless. She saw this book somewhere and I liked it and got one and loaned it to her, and off she went. Her very first hat looked as if it would fit a giant. If that had happened to me, I might have thrown the book across the room and stomped away in disgust, but not Jackie. She was undaunted, and tried again. I think, but I’m not certain, that this was her third attempt. And it was a huge success! Not only does the hat look great, but it looks great on her, a wonderful match to her coloring and hair. She says this hat is a gift for someone, but personally? I hope she gifts it to herself. I think Jackie deserves such a lovely thing. As for me, it’s back to the scarf. I must keep knitting, must keep knitting, must keep knitting… ciao for now. My daughter hates to knit scarves as they’re so boring. Or so she says. But there are times when I need the monotonous. And I think Fair Isle is next on my list of things-to-learn.